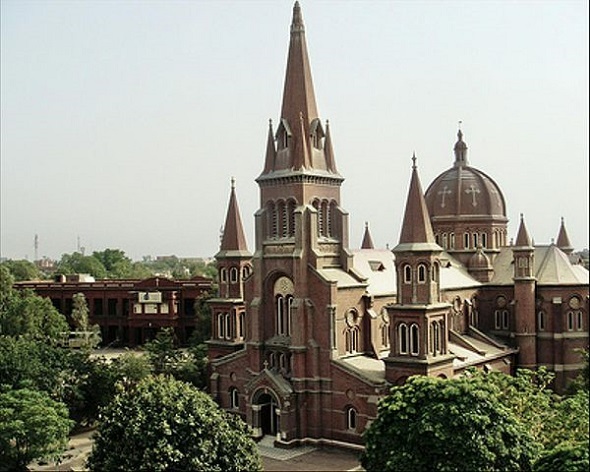 St. Anthony's Cathedral, Lahore. (by Kasim 39). Pakistani Christians accused of blasphemy have to live in hiding - even if the court says they are innocent. The law says that if you insult Islam, the punishment can be death. Some people say that they charge too many Christians with this, for crimes that are not important. And after the court finds them innocent, they have many problems. Many leave their home areas and are very afraid that extremists will find them. Since 1990, at least 65 people have died in cases linked to blasphemy in Pakistan – but there have been no legal executions. Rubina Bibi and her family had to hide five years ago. She is a Christian from Ali Pur Chattha in Punjab. A man saw her arguing with a local woman who, she said, sold her butter that was bad. The man then said this was blasphemy. Bibi was put in prison for months with her one-year-old baby while officials decided the case. Bibi was set free, but they had to move to Islamabad to feel safe. They are hiding and it is very difficult for them to feed their children. The laws of blasphemy began in Pakistan in 1860, when the British were in control. Only 15 people were prosecuted until 1986. But there have been many more cases after Zia-ul-Haq, the military ruler expanded the laws to include, for example, insulting the prophet Muhammad. He introduced the death penalty for this. But there is some hope. Pakistan’s Supreme Court decided in 2015 that changing the blasphemy laws does not break the law. But the religious Right are against this. NOW READ THE ORIGINAL: http://newint.org/sections/agenda/2016/03/01/pakistani-christians-in-fear/ (This article has been simplified so the words, text structure and quotes may have been changed).